Two of the top questions Americans ask when purchasing flowers are "How do I take care of them?" and "How long will they last?" Whether it's a single bud, a small bunch or an abundant arrangement, a little extra care can make a big difference. Keep the vase filled or floral foam soaked with water containing a flower food provided by your florist. If the flower food solution becomes cloudy, replace it entirely. If possible, recut stems by removing one to two inches with a sharp knife. If you can't get your flowers in a flower food solution right away, keep them in a cool place. 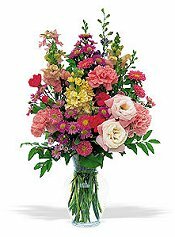 Fill a clean, deep vase with water and add the flower food obtained from your florist. Be sure to follow the directions on the package. Recut stems with a sharp knife. Do this underwater -- this allows the stems to draw in water instead of air -- and place the flowers in the vase solution you've prepared. When using woody stems and branches (such as quince, forsythia or lilac), cut the stem with sharp pruning shears. Place in warm water containing fresh flower food to promote flower opening. 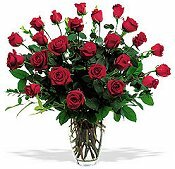 Roses must be in water within 1 hour. Keep roses cool before...and after...arranging. Do not refrigerate. Add water with floral preservative upon receipt and refill daily to keep vase full. 1 Package of flower food per pint of water, less flower food is better. Remove leaves that will be underwater. Display in cool area away from drafts and direct sun. Keep roses away from any fruit or vegetables, especially apples. Our roses should last 5-7 days, sometimes lasting 10-14 days. Submerge the stem under water. Cut off 1 " or more using a sharp knife. ABOUT YOUR WATER -- Avoid if possible use of water from a home or commercial water softener.